AirDesign’s philosophy is to design wings for the target pilot in the class. RISE 2 is ideal for pilots who have experience with an intermediate glider and are looking for a wing with more performance and agility, whilst demanding a high level of passive safety. RISE 2 is aimed at pilots who want to fly long cross-country flights on a wing with good performance, whilst also with the security and passive safety to deal with those unexpected moments when conditions change during a flight. It is also an ideal glider for those pilots stepping back from higher rated wings who want performance with greater passive safety. RISE 2 is not recommended for beginner or novice pilots. RISE 2 is a new generation wing! The aerofoil design and detailing, internal structure and line layout are completely new and developed from the designs of our performance gliders VOLT and PURE. RISE2 is a performance EN B glider aimed at cross country pilots and designed with the optimum characteristics of an XC wing in mind. Performance, safety and comfort in flight in all conditions were the major design considerations. The ‘trademark’ AirDesign comfort in flight gives pilots a real confidence boost which helps them achieve their goals. As there are only very few really small B-class gliders available, we decided to certify RISE 2 XXS with only 16.28 m² projected. Some companies call their gliders XXS, but if you check their actual sizes you will see that they are not really suitable for very small and light pilots. For this purpose, we have especially trained a very light pilot to fly the wing with the accurate loading in practical flying conditions. So this glider is a real XXS glider made for light pilots and tested by a light test-pilot . The standard weight-range for size XXS gliders is 50-65 kg. The RISE 2 XXS, however, has a special certification with a higher wing-load up to 75 kg. 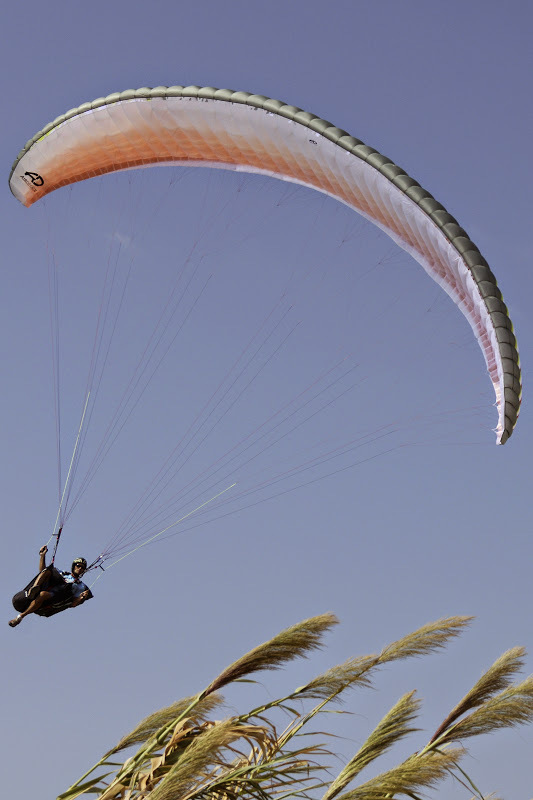 When flying within this extended weight-range, the speed increases but safety remains within the EN-B category. We don’t usually talk much about the performance of our gliders because it’s a very subjective thing. Different pilots can have very different opinions of the same wing. However, even we were excited by the gains in the RISE 2! We focused our attention on the useable glide and have produced a wing with superlative glide into headwind. The combination of a new aerofoil, the reduction in line consumption, and the design features; shark nose, razor edge, 3D cutting, mini-ribs and polyamide rods have together produced a performance gain of 0.8 glide ratio over the complete speed range! We have achieved an improved passive safety with RISE2. The wing is even more stable and cuts through turbulence with little reaction, helping the pilot enjoy stress-free flying even in lively conditions. To ensure we have achieved the best recovery results during development we tested the glider in extreme flight conditions to a degree well beyond those required by the EN norm. We want you to feel truly confident in the wing so we pushed the boundaries of flight and recovery with extreme deformations, collapses and stalls. The agile handling helps the pilot control the wing with a more precise feeling. 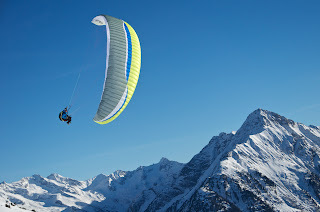 RISE 2 is characterised by very precise handling, the glider is agile and easy to turn. While thermalling, it is easy to change the angle of bank and to tighten or flatten the turn. 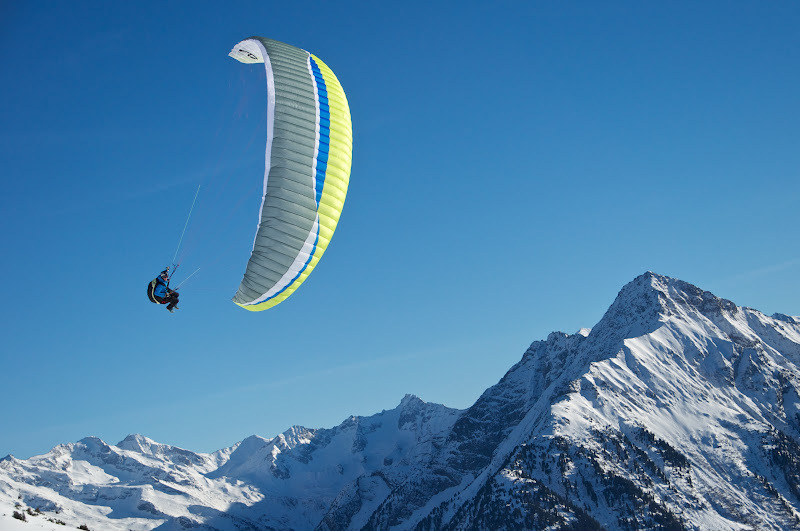 The innate reaction of RISE 2 to locate in the strongest part of the climb makes coring thermals effortless and efficient and while on glide the wing transfers a perfect balance and stability helping the pilot to locate the next climb. Brake pressure is lighter and requires less physical input than for the original RISE increasing the feeling of relaxation and enjoyment during long flights. However, the balanced feel and increase in pressure while progressively braking harder helps to avoid an unintentional stall. 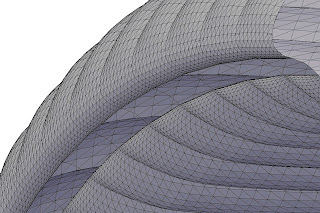 3-Line-System: a 3-line concept with the inner C lines split to form short D lines. This new line layout reduces line consumption by 14% with a corresponding reduction in drag. Shark Nose optimally transfers brake input and maintains pressure in the wing. Polyamide rods in the leading edge keep the profile in perfect shape and improve stability and launch characteristics. 3D Cut: a technical sail cutting method is used for all panels across the leading edge area. This produces an improved air flow and increased performance. Mini-ribs in the trailing edge improve surface finish and reduce drag. Razor Edge: A specially designed trailing edge which optimises the profile and reduces drag. The 2-in-1 progressive brake line layout improves climb characteristics. The centre brake fan is attached slightly in from the trailing edge to improve climb. At the tips, the brakes are gathering the trailing edge and assist precise turning whatever the conditions. Risers: 12mm wide performance risers. Easy-going accelerator for performance at any speed. Why does the RISE 2 have a shark-nose and what is optimised? Stephan Stiegler:The shark nose improves handling and the stall behaviour of the wing by maintaining pressure and therefore stability during accelerated flight. How was it possible to reduce weight? Stephan Stiegler:The inner structure is designed to correspond to the optimised line layout. This reduces the weight of the internal ribs and straps. Risers are optimised for performance and weight savings. What is new in the brake-line concept? Stephan Stiegler:The new and more efficient brake gathering system is effective and extremely durable since there are no points of friction. How does the wing feel when accelerated? Stephan Stiegler:We reduced the pressure in the system and trimmed the accelerator travel for performance in combination with stability. This makes it easy and relaxing to use and confidence inspiring in how the wing behaves at speed. A few weeks later and I was airborne again in an AirDesign RISE2, courtesy of Cloudbase Paragliding. What a surprise package this glider turned out to be! Outpacing a Delta and Synergy on trim, and matching speed if not glide angle of these EN-C’s on speed bar. It is easy to launch and fun to throw around, and forgiving if you don’t get the timing quite right - which may have happened when I was showing off. The brakes are responsive with long travel and progressively get heavier, giving plenty of warning before the stall point. Weight-shift turning is also progressive and the RISE2 exits spirals as soon as the brakes are eased and climbs out. I also had a little flying inland at Manilla on this wing in 3-5 metre thermals and I felt very comfortable doing a triangle out to split rock and back along the river. Balls on the C risers make rear riser steering a breeze. The very thin upper cascade lines (and there aren’t that many of them) are unsheathed but don’t get caught on twigs and sticks as I have had happen on some of my other gliders. Big ears pop out easily and with no pumping. My only criticism was that they tended to flap at times. I discussed this with Mark who reminded me of AirDesign's new big ear technique (outside B line) and voila - ears fold in beautifully. This is a fun glider with great performance and a very forgiving nature, and I have had a ball flying the RISE2. I was flying a medium size within 5 kilos off the maximum weight inland and a little lighter on the coast. "Preparing for take-off is super simple! The lines are easy to differentiate and lay out, also thanks to their different colours. The canopy is very stabile. The sail shape looks nice, I have noticed - watching others fly this glider - that it levels off beautifully towards the back. Even though conditions were sometimes quite rough, it was easy for me to concentrate on the other pilots and what's around me. It is important to have time to look down and to check where the thermals are. What I really loved was that in a thermal, I could turn the glider the way I wanted it to, not the way the glider wanted to! Flat, steep, tight, it didn't matter, I could do whatever I considered necessary. The RISE 2 reacts great on brake-shift with tight and especially very flat turns. The speed system is extremely easy-going and doesn't need much pressure. Hardly any height loss and great glide when pushing the accelerator and in accelerated flight. 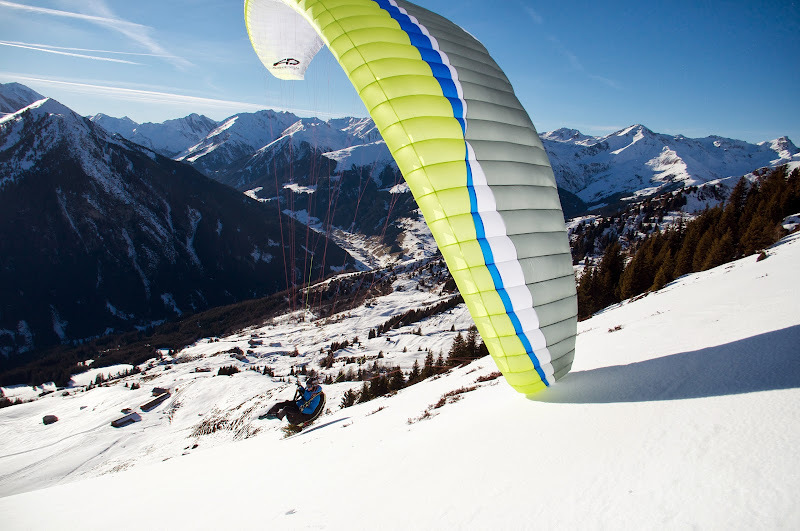 When thermalling in accelerated flight, the glider feels extremely safe and the performance is convincing! The RISE 2 has a vast and very good speed range. The glider reacts well and effective on the use of the C-Balls. The RISE 2 glides bloody well! Landing is extremely smooth. The glider flares superbly."